Last month we played with dreaming a little dream. Now it’s time to take a step forward to make our dream(s) a reality by putting ourselves out there…full on. For many of us, this can be a major challenge…especially if we tend to be as others expect us to be rather than who we really are or want to be. Are we being authentic in everything we do or say? Is what we do true to ourselves or is it someone else’s truth? Do we hide our authenticity from others for fear of rejection, ridicule, shame, etc? This requires us to be ever diligent in questioning our motives for doing what we do. Is this really what I want to do? Or am I doing it because it is expected of me or it’s someone else’s agenda? How do I really feel about what’s going on in my life? Am I honoring my authentic self? Yes, it’s true that those around us may resist our choice to live authentically and usually for a variety of reasons, usually based on their own insecurities and fears about themselves. It may also put them in a position where they must look at their own lives. Are they living their own truth? True peace and joy comes from freeing ourselves of our false personas and choosing instead to live our own truth. 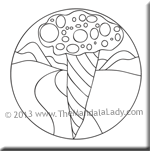 Ponder this as you color the November 2013 Mandala of the Month. Be sure to download Section 11 of the 2013 Mandala of the Year.